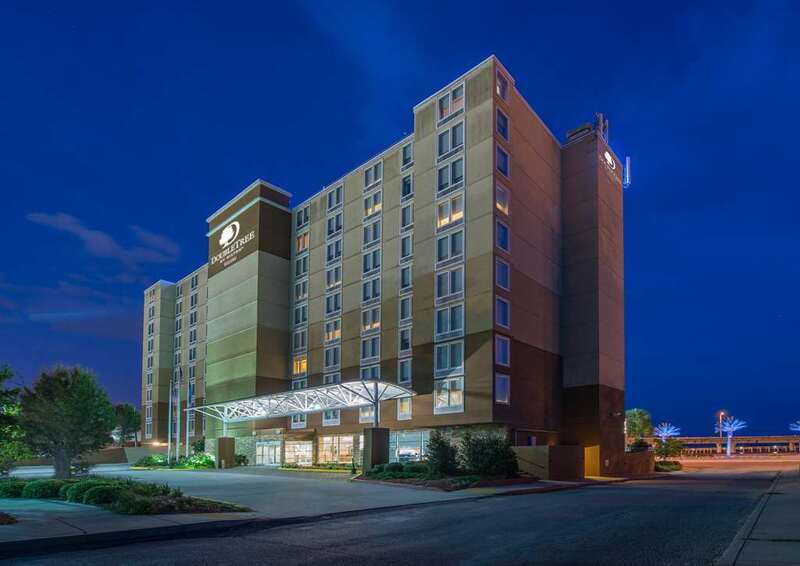 Set next to the MGM Park at Beau Rivage professional baseball stadium and just steps from a stretch of beautiful beach DoubleTree by Hilton Biloxi is also just minutes from the downtown business district. The hotel enjoys close proximity to lots of casinos entertainment venues and marinas. Discover lots of shops specialty stores and eateries at the Promenade shopping center - just three miles from our Biloxi hotel. Take advantage of our convenient shuttle service to nearby places of interest. Settle into a spacious guest room or suite at this Biloxi hotel offering fantastic gulf views and homelike amenities such as WiFi a coffeemaker a retractable desk and a safe. Start your day with a delicious breakfast in the stylish GT*s Restaurant - Bar which also serves fresh seafood crisp salads juicy steaks and more for lunch and dinner. After a busy day unwind in the bar with a locally-brewed craft beer. Print documents and check emails in the 24-hour business center. Plan a Biloxi meeting conference or wedding reception in one of two versatile meeting rooms. Host a banquet for up to 150 people in our award-winning restaurant or organize an al fresco event on the large outdoor terrace. Refresh in the outdoor swimming pool or enjoy views of the beach as you exercise with the latest cardio weights and resistance equipment in the fitness center. Our friendly staff looks forward to welcoming you at check-in with a signature warm chocolate chip cookie. Ruth Chris Steakhouse Biloxi: Located in the Hard Rock Casino this steak restaurant provides an upscale dining experience for special occasions. Shaggy*s Bar - Grill: Shaggy*s is a fun beach laid back restaurant with locations on Biloxi Beach Pass Harbor and Pensacola Beach. The menu is creative fun food with great choices for almost anyone. Looking for the perfect place to hang out or kick back. Come to the water and bring your vacation to dinner with you.